Posted October 13, 2018 by Sophie Davies & filed under Features, News. After discovering that his father has squandered the family savings, Will foolishly borrows money from his nemesis Robert Greene to invest in England’s first purpose-built theatre. Standout moments of this episode include Kate dressing up as a boy in order to attend a planning meeting for the new theatre – at which it is decided that a precedent will be set for all future theatres’ toilet facilities with “a 20-yard pissoir for the men and a single bucket in a cupboard for the ladies” – as well as a brief cameo from Blackadder’s Bob when Will is put on trial. Kate is thrilled with Will’s plan to put a strong female character at the centre of his new play… until he reveals his intentions to “crush, abuse and humiliate her” for the enjoyment of men. In an effort to prove that the methods used to ‘tame’ his play’s heroine are feasible, Will tries them out on his rebellious daughter Susannah, but naturally she isn’t having any of it. Of all Shakespeare’s plays, The Taming Of The Shrew is arguably the most misogynistic from the perspective of a modern audience, but this episode manages to deal with it in a humorous way by highlighting its sheer ridiculousness. 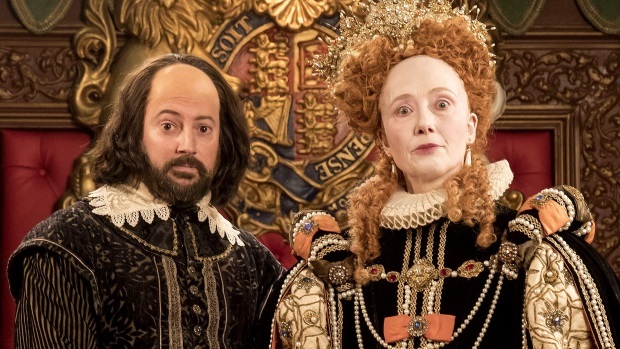 In this festive special that aired between series 2 and 3, Anne’s plans for a family Christmas are scuppered when Will ends up inviting Kate, Bottom, Marlowe and even Robert Greene around for the day. Of course Greene has ulterior motives, fuelled by envy that Queen Elizabeth has commissioned Will to write a new play for Christmas. Fittingly, as Emma Thompson guest stars as the Queen, this episode includes a great reference to Love Actually when Anne suspects that Will has bought a romantic gift for another woman. Nominations for the London Theatre Awards are announced, and Will has been shortlisted in every category. Certain that he is going to win, he invites a glamorous date to the Awards and chooses to go to them over his son Hamnet’s confirmation – a decision that comes back to haunt him later, with the series ending on an unexpectedly tragic note. Thanks to some top-notch performances from David Mitchell and Liza Tarbuck, the sudden tonal shift doesn’t feel too jarring and it even left some viewers with tears in their eyes. 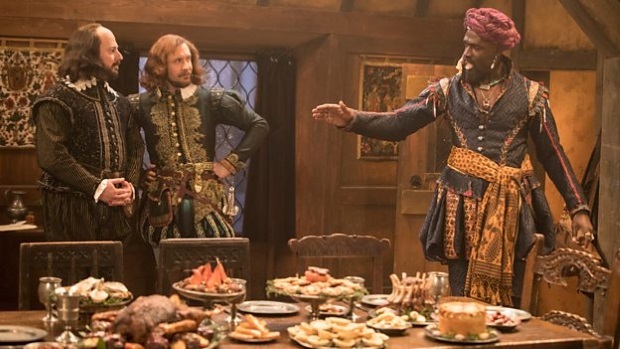 When an African prince comes town, Will invites him round for dinner in an effort to boost his social standing. But when Prince Otello takes a shine to Kate, Robert Greene spots an opportunity to sow seeds of jealousy and turn Otello against Will. Mark Heap is at his panto-villain best as Greene in this fun series opener, and some highlights in the dialogue include Will commenting “Like the narcissistic contortionist, I’ve buggered myself” plus Kate defiantly telling Will that he could never play a female role on stage because “The law states that to play a girl, one must have bollingbrooks, and you have yet to grow a pair”. Will decides to present his collection of sonnets to the figures who feature most prominently in them – the ‘Fair Youth’ and the ‘Dark Lady’. 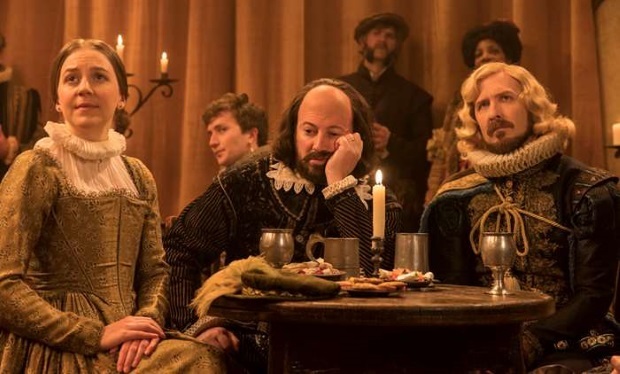 Naturally, Anne isn’t best pleased about the fact that her husband has written 154 love poems to people who aren’t her (“Women, they’re so bloody sensitive!” comments Marlowe), so Will attempts to make it up to her… that is, until he gets arrested for the smutty content of his work. Ultimately, he doesn’t know whether to be grateful or insulted when Marlowe gets him off the hook by arguing that his sonnets are less “an incitement to sexual depravity” and more “an incitement to a nice long nap”. Kate teaches Marlowe to speak Italian, which results in them falling in love (or more accurately lust), while Will struggles to write his first comedy. When Marlowe goes away to Verona and Kate has doubts about his ability to stay faithful, Will sees the potential for an amusing “romcom in an exotic location”, so encourages Kate to pack up and disguise herself as a boy in order to spy on her beloved. 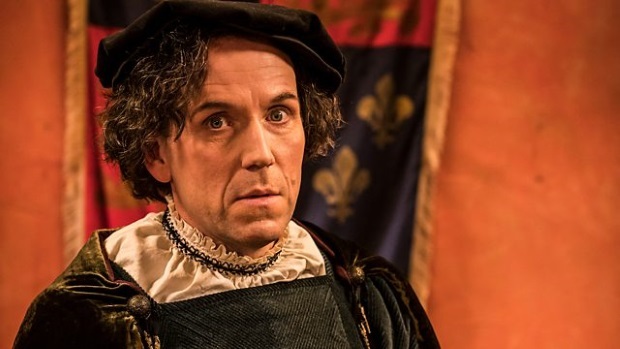 After all, he couldn’t possibly recognise her – “she’s wearing pufflingpants and a boy’s hat!” This episode gets extra marks for featuring the line “I can’t imagine there’d be much public interest in digging up Richard III”. After the success of A Midsummer Night’s Dream, Robert Greene plots to destroy Shakespeare’s reputation by starting a rumour that he didn’t really write his own plays. Will finds out that Greene intends to kick off this nefarious scheme by having Marlowe killed, so devises his own plan to fake his friend’s death using the plot of his new play, Hamlet, as inspiration. Most of this episode’s best moments stem from a running gag that everyone in Will’s life refuses to take Hamlet seriously, culminating in him frustratedly trying to explain the play’s violent climax to his laughing friends. Will finds himself harbouring a criminal when his old schoolmaster comes to stay uninvited and reveals himself to be a Catholic, which under the rule of Queen Elizabeth is “satanic heresy”. Things then become even trickier when Marlowe also turns up at Will’s home unexpectedly, on the hunt for Catholic spies, meaning Will must keep the two men separate from each other as much as possible. The farce reaches a crescendo when a Catholic noblewoman and a “tartingslap” arrive at the house on the same night, to see the schoolmaster and Marlowe respectively, resulting in some big misunderstandings.